Create, deploy and monetize on-demand SD-WAN and vCPE services, IT applications and value-added VNFs rapidly across B2B and residential markets with our end-to-end environment. Want to learn more about NaaS? 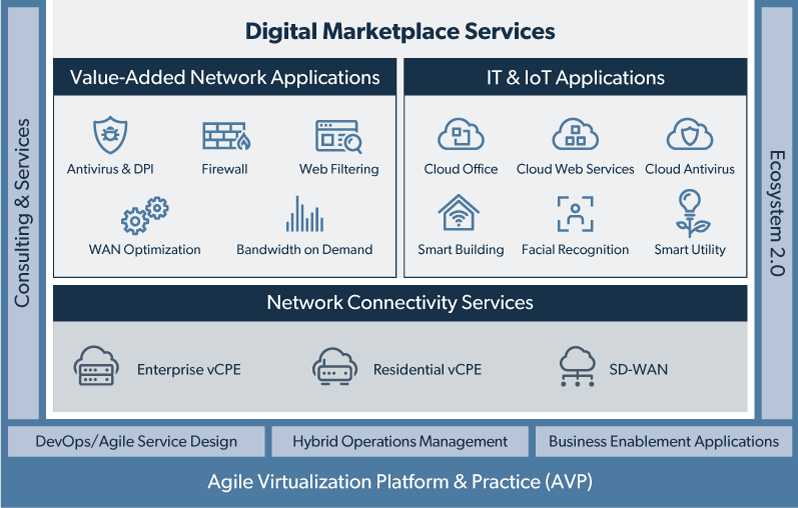 Focused on revenue growth, NEC/Netcracker's Network as a Service (NaaS) provides a full-stack solution that includes VNF onboarding, service design, SDN control, orchestration and a digital marketplace to help you deliver a range of new services quickly. It reduces time-to-market by as much as 70 percent, increases ARPU growth up to 25 percent and reduces churn up to 30 percent. Our full-stack NaaS solution addresses four layers—business, operations, control and network—and includes an Agile/DevOps service design environment. With it, you can create personalized bundles through a digital marketplace, offering services like SD-WAN, vCPE, value-added services and IT apps. Our solution allows you to start with any service and grow incrementally, easily adding new services to become a one-stop shop for large enterprise, SMB, SOHO and residential markets. Our award-winning Ecosystem 2.0 program includes more than 200 onboarded VNFs and IT apps to provide a rapid path to full commercialization. NEC/Netcracker helps service providers make the transition to virtualized networks and services with an award-winning SDN/NFV solutions portfolio. With our full-stack NaaS solution, you can fundamentally enhance how business services are delivered and consumed. Simplify the transition to software-defined and virtualized networks with a comprehensive automation platform covering hybrid orchestration, service design, BSS-ready applications and a broad ecosystem. Enhance customer experience with a digital marketplace where customers can browse, purchase and manage cloud, IT and VNF-based services on demand. With a unified product catalog and robust tools for partner and subscriber management, we support your new revenue growth, market expansion and new business model strategies. Operate virtual and traditional networks simultaneously at scale. HOM leverages years of proven expertise in end-to-end service management and MANO. It automates operations, including assurance, VNF-agnostic end-to-end onboarding, security, license management and advanced analytics. Designed to accelerate commercialization for new digital services that leverage virtual and software-defined networks, BEA enhances your existing BSS with microservices-based applications that support on-demand experiences, simplified partner management and monetization of emerging business models. The next evolution in partner collaboration, Ecosystem 2.0 accelerates full commercialization of multivendor virtualized services. It simplifies operations for services derived from multiple partners and enhances service innovation. With tools, techniques and repositories for defining VNF and network service descriptors, our solution provides reusable models that improve efficiency, reduce time-to-market for new services and help you adopt a DevOps approach to operations.